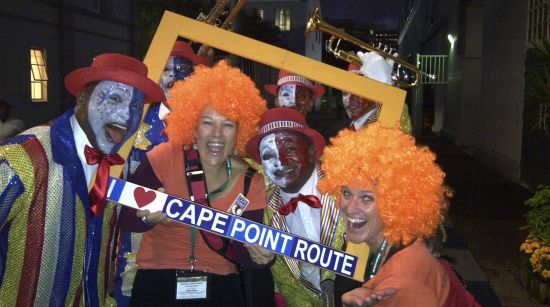 Every year Cape Point Route travels to Durban in early May to attend the Tourism Indaba – a platform for the Southern African tourism industry. The trade show attracted some 13 000 visitors and exhibitors over 4 days and was one of the most digitally connected trade shows to date. We found the Cape Minstrels in Durban! The tourism industry capitalized on the season’s growth by tackling issues in the industry with technology and creativity. One of this year’s innovations was called “INDABA-connect” – a powerful, simple gadget connected to participants name badges. The connector enabled sharing of information, contact details and images by simply touching the fellow participants connector tab. Statistics show that more than 150 000 connections were made during the 4 day show and saved more than 350 trees! Sustainable and responsible tourism were an additional focus for the industry – highlighting traveller demands for purchasing fair-trade products, using companies with responsible life-style practices and companies that support community based tourism. Creativity was evident with a strong focus on heritage and culture and there was an impressive Heritage and Culture Pavilion showcasing South Africa’s 8 UNESCO World Heritage sites as well as creative designs in fashion, photography, art and music. This tied into the need for travellers who want real experiences that combine people, lifestyle and interests with their sense of place and promoted Cape Town as World Design Capital in 2014. 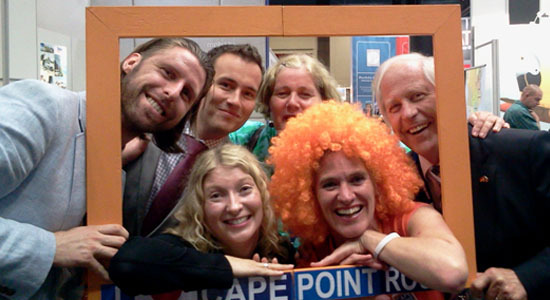 Cape Point Route wowed the show with an innovative campaign targeting the so-called “me- generation”. 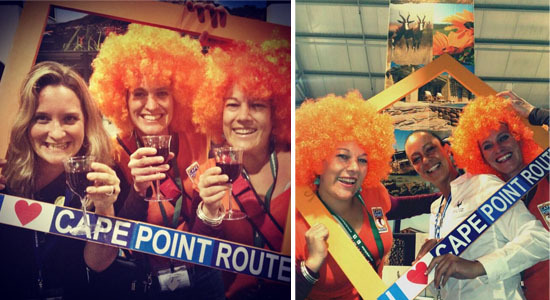 Dressed in bright orange wigs and armed with an orange picture frame stating “I love Cape Point Route” – Barbarba Elshove-Schmidt and Sally Grierson roamed the show framing visitors and exhibitors in images. The campaign was well received and generated social media engagement, awareness of the southern Cape Peninsula as a destination and productive meetings with international tour operators and local domestic tourism products. Sally re-iterates, ” It was an extremely successful and fun campaign. 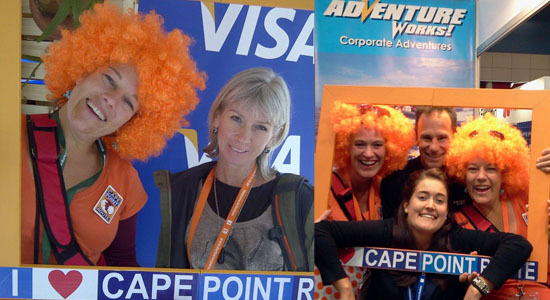 We met lots of people through the activation and as a result managed to spread the tourism word on how much there is to offer on the Cape Point Route. Tourism is not a “soft industry” any more – it contributes significantly to South Africa’s economy and as a result it is a competitive market place where one needs to stand out from the crowd to get noticed. I think our campaign achieved that and also sent the right message and it is very rewarding to be quoting on jobs already”. 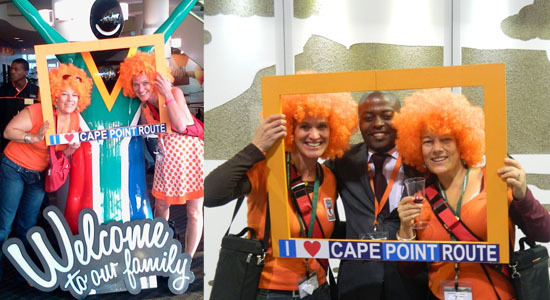 This entry was posted in Holidays and Special events and tagged Cape Point Route at Indaba 2013, Indaba 2013, tourism Indaba 2013, tourism trade exhibition. Bookmark the permalink.